“Everything in Bushwick will change after this talk,” said Peter Hopkins regarding the talk Confronting Bushwick that is being hosted at The Bogart Salon. Peter Hopkins is the co-owner of one of the new galleries in Bushwick, The Bogart Salon, and additionally he curates the building at 56 Bogart. In case you haven’t heard yet, the huge yellow building across the street from the Morgan subway entrance, 56 Bogart is currently home to seven galleries, including two big art non-profits, Momenta Art and NURTUREart. Additionally, more galleries are expected to move in pretty soon, including a Bushwick branch of a SoHo gallery, Christina Ray. 56 Bogart is something like a gallery mall, or a gallery arcade as Peter Hopkins likes to say. Its presence in Bushwick is bitter sweet. On one hand, it’s awesome that seven galleries can coordinate their openings and attract more people to come. On the other hand, it’s changing the game in Bushwick where most of the “old” galleries were DYI, artist run spaces, working mostly on a non-commercial basis. 56 Bogart attracts commercial gallerists from around the city. Also let’s not forget about Luhring Augustine, big fancy gallery from Chelsea, who are having their first opening in Bushwick on February 17 few blocks away. Confronting Bushwick aspires to cover all these topics and more. The panel is hosted by Hrag Vartanian, editor of Hyperallergic. Other panelists are Deborah Brown, artist and owner of Storefront Bushwick gallery, Thomas Burr Dodd, artist, owner and founder of Brooklyn Fire Proof; Carolina A. Miranda, art critic and culture writer for WNYC and Artnews; and Marco Antonini, Director of NURTUREart. The question is whether the panel is diverse enough to speak for the entire art scene in Bushwick. Several people pointed out that the panel doesn’t contain anyone from the original Bushwick gallery owners, only people who came to Bushwick just recently. Peter Hopkins objected that they wouldn’t accept the invitation for a panel discussion anyway. 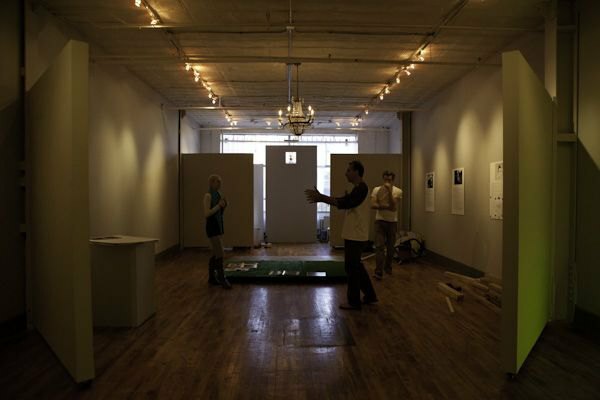 We can sense certain tension between the “old” and the “new” gallery owners in Bushwick… Peter Hopkins also said that he expects a lot from the discussion and that “It will be a dividing point. Bushwick 2.0 begins now." Bushwick is changing. That much we can state without any doubt. The question is how will the change be? Friendly? Natural? To the benefit of us all? Or drastic? Exclusionary? And eventually pushing the rents so high that the artists will leave? Let’s see. About this and more, will be the discussion tonight from 6 to 9pm at The Bogart Salon at 56 Bogart. RSVP on Facebook here. Everyone will be there, and it will be heated!